I have seen a variety of different spelling of the word vareneki, but it really doesn't matter what you call them, they are delicious. 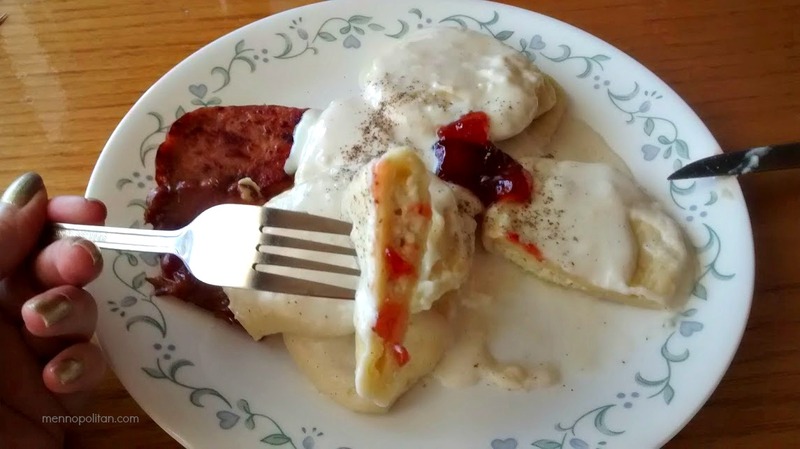 I grew up with glums filled vareneki, along with heated heavy cream with salt and pepper added. We call it schmaunt-fat. I also like glums vareneki with a milk based béchamel sauce in place of the heavy cream. Melt the butter then add the flour and sauté until the flour starts to brown. Add 3 cups of milk or cream and boil 3 minutes or until it thickens then add salt and pepper. 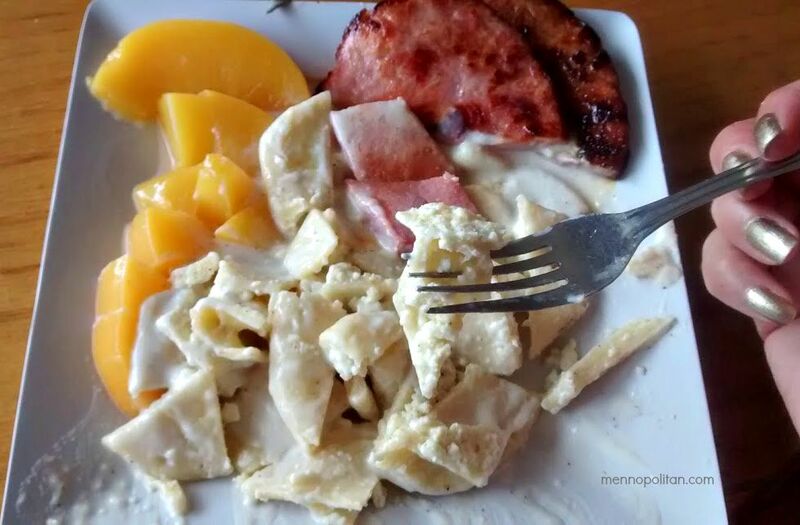 With your hands combine egg yolk, salt, pepper and glums cottage cheese well (you can use regular store bought cottage cheese too, but you would just have to allow some of the moisture to drain using a fine strainer before adding the egg yolk, salt and pepper). Make the dough. Combine eggs and flour together well. Continue adding little bits of flour as you knead the dough until it isn't sticky at all. On a lightly floured counter roll dough out to desired thickness into a large rectangle or roll it out on the pasta maker. Using spoon place a ball of filling along one end of dough. Fold dough over filling and flatten the dough over the filling so that there is no air in the pocket. Using a small round cutter (or small a bowl) cut out Using spoon place a ball of filling along one end of dough. Fold dough over filling and flatten the dough over the filling so that there is no air in the pocket. Using a small round cutter (or small a bowl) cut out vareneki. If you find that the edges aren't sealed just pinch as needed. Place the vareneki on a slightly floured surface or a parchment lined cookie sheets until ready to boil. You can also freeze on the cookie sheets. Once they are frozen you can bag them for later use. Bring a large pot of water with 1 tbsp butter or oil to a boil. 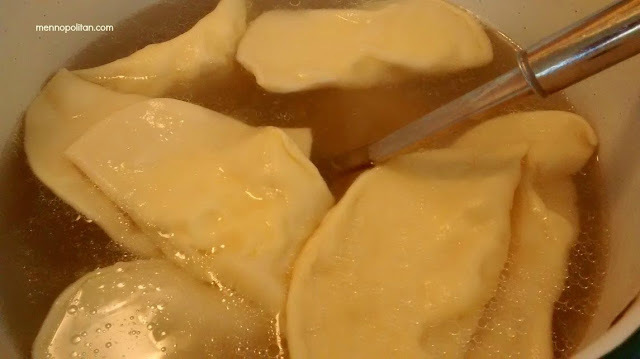 Drop fresh or frozen vareneki into the boiling water and boil 5 minutes if fresh, or 10 minutes if frozen. Vareneki will float when they are done. Drain and separate if you don’t want them to stick too much. 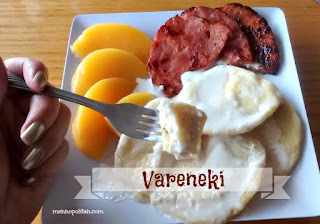 Serve vareneki with schmaunt-fat (béchamel sauce) räakworscht (smoked sausage) or ham and canned peaches or pineapple. Vareneki are also good with a spoon full of strawberry jam on top of them.